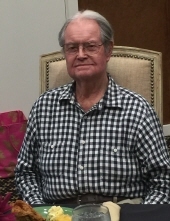 Joe R. Price,85, of Lumberton, passed away Friday, November 9, 2018 at his home. Visitation will be Monday, November 12, 2018 at Lumberton United Methodist Church from 11 a.m. until 1 p.m. with services immediately following. Burial will be in Lumberton City Cemetery. Mr. Price was of the Methodist faith. He served in the United States Army and worked in production for Cheveron for 50 years. He was preceded in death by his sister, Marnell Wynn. He is survived by his wife, Eleanor Price of Lumberton; one daughter, Melody Price Bryant (Robert Allen Bryant) of Lumberton; one granddaughter, Lindsey Bryant Williams (Albert Williams) of Hattiesburg; two great-grandchildren, Aidan Thomas Williams and Clara Kate Williams; and three nephews, Joey Price of Little Rock, AR., Roger Wynn and Ricky Wynn, both of Star City, AR. To send flowers or a remembrance gift to the family of Joe T. Price, please visit our Tribute Store. "Email Address" would like to share the life celebration of Joe T. Price. Click on the "link" to go to share a favorite memory or leave a condolence message for the family.